Craft cocktails in a bowling alley? The Spare Room is boozy entertainment at its finest. 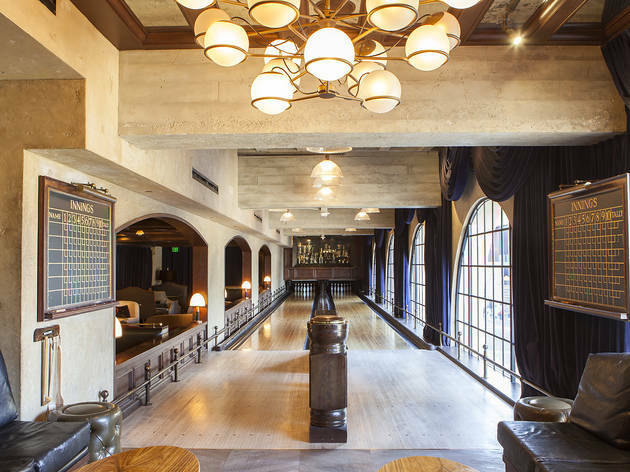 A bowling alley might not be the first place you’d think to grab drinks in Hollywood, but this isn’t any ordinary bowling alley. 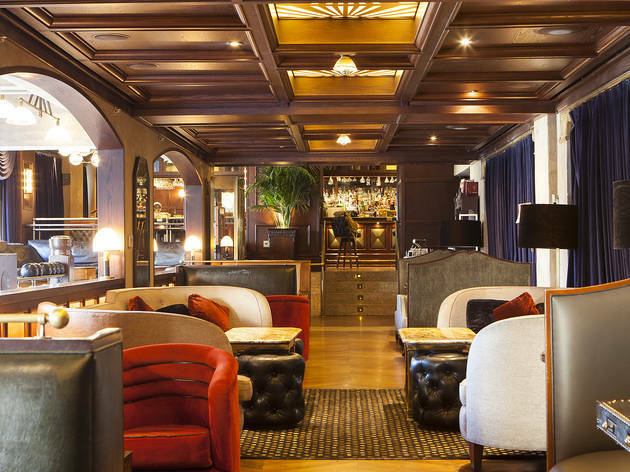 Stashed away in the shadowy mezzanine above the Hollywood Roosevelt Hotel lobby is the Spare Room, devised to evoke pure revelry. 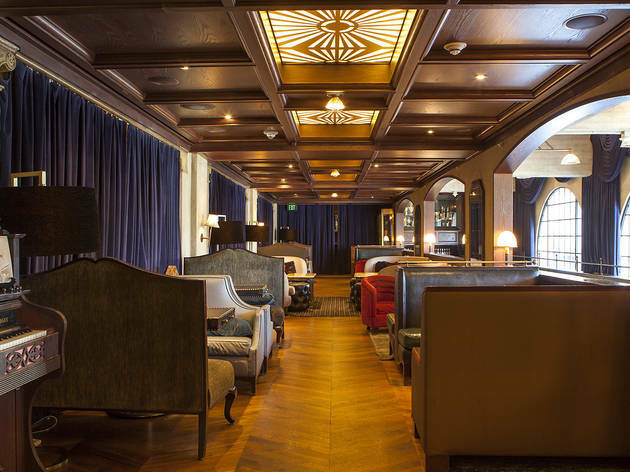 A show-stopping set of lanes dating back to the early 1800s stretch the length of the handsome parlor, oozing with Art Deco elegance and a clear view of Hollywood Boulevard out of big cast-iron arched windows. 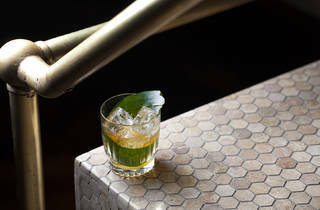 Though let’s face it: the real reason to visit this covert gaming lounge bookended by two gleaming bars is the ace drink program, originally conceived by Aidan Demarest (Seven Grand, BarToni’s) and recently revived by rising star Yael Vengroff (Harvard & Stone). 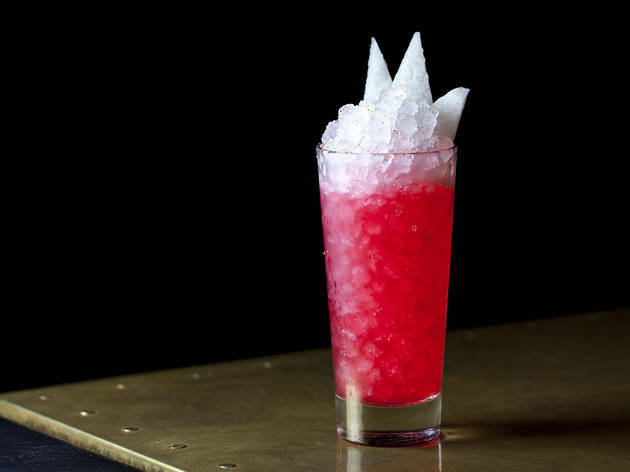 While the Spare Room has historically been known for its punch bowls (there are four to choose from), Vengroff has upped the ante with 17 whimsical cocktails that feature surprising ingredients like pickle brine and coconut oil-washed vodka. Based on the half-dozen-or-so drinks our group collectively tried, we can safely say that there is not one bad swill on the menu. Of course, if handcrafted ‘tails aren't your thing, by all means bowl. It just means more room at the bar for the rest of us. 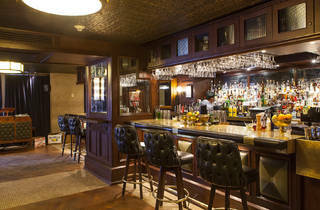 Good for: Inventive mixology in a comfortable, sophisticated setting. Sidle up to the bar with a date or grab fellow night owls and stake out a cluster of velvet armchairs in the lounge area for a friendly (and free!) game of Monopoly, Jenga, Scrabble, or even Mancala. The games hostess (yes, that’s a real thing) just needs to hold onto an ID. Don’t miss the Spare Room’s monthly tiki night, which features guest bartenders from across the country and runs May through September. The scene: It can get crowded here, on any night of the week—even 1am on a Sunday. It used to be that guests would have to know a celebrity to get in, but these days there’s no door policy or strict dress code. There’s still an intimidating bouncer, however. Expect loud music ranging from jazz to rap and plenty of Hollywood types, especially on Mondays when an exclusive bowling league competes. If you’re worried about getting inside, reserve one of the two lanes a few weeks in advance by emailing reservations@spareroomhollywood.com or calling 323-769-7296. FYI, an hour rental costs $100 for up to six people. Drink this: Vengroff’s specialty is of the tiki variety. 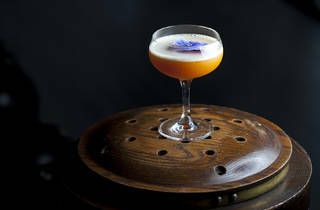 The Bikini Kill ($15) is made with passion fruit, Campari, Velvet Falernum, honey and lemon. Seems simple, right? But the main ingredient will surprise you: Vengroff fat-washes vodka with coconut oil, giving the tiki-inspired libation a velvety yet overall dry flavor. 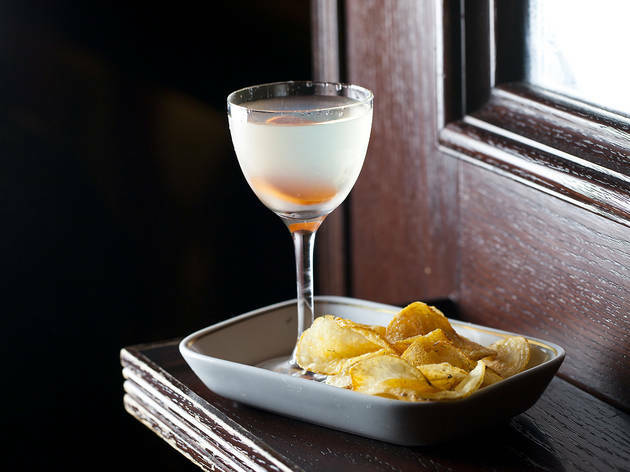 For dirty martini drinkers, the Salt & Vinegar Martini ($15), made with potato vodka, dry vermouth, pickle brine and celery shrub, takes the classic drink to a whole new level. 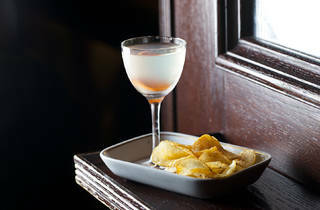 Plus it comes with potato chips, which we realize is now the only way to truly enjoy a dirty martini. 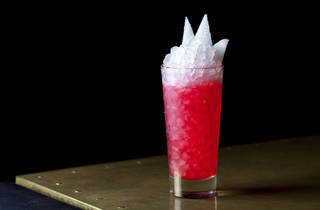 And it’s worth noting, Vengroff spent two years perfecting this cocktail, so that alone should be worth giving it a try. 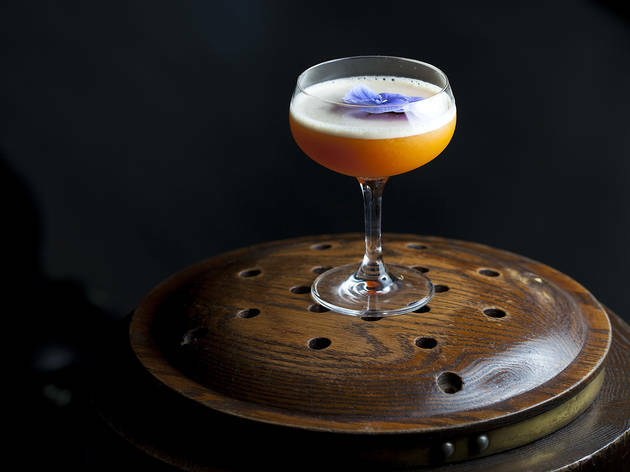 For the mezcal drinkers out there, the Porcelain Dragon ($15)—crafted by another Spare Room bartender, Pablo Chavez—balances the smoke with tart hibiscus and lime, savory basil and sweet sherry, all shaken and then poured over crushed ice. Meant for sharing, this one comes with two straws. Last but not least, Lucky Smoke ($17), a balanced blend of Japanese whiskey, navy-strength Jamaican rum, banana liqueur, vanilla and Good Luck bitters is well worth the premium price tag. 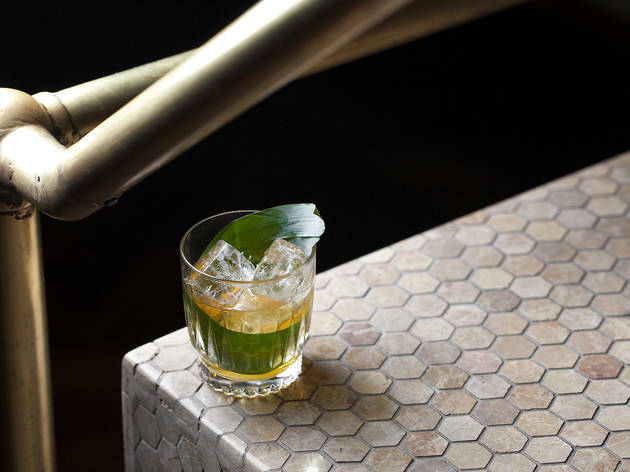 The Pandan leaf garnish, which gives the drink a buttery vanilla finish, really blew us away. Our tip: It’s about $20 to park in the garage across the street, so catch an Uber or a Lyft to save money and spare the headache. Valet is around the same price. Also, there’s a secret photo booth behind where they keep the rental shoes. Love this bar! Drinks and bowling are a tad expensive. However, craft drinks are unique to this bar! Ambiance is welcoming with an old Hollywood vibe. Music is always great. Sunday nights = bingo night with drinks and bowling giveaways. Love this place—the drinks are delicious, there are fun games to play and you can even bowl on an old-school double lane if you have $100 to spare (heyo). The cocktail bowls are impressively tasty and fun to share. My only question is why the cocktail waitresses wear booty shorts here. Seems a little trashy and outdated. 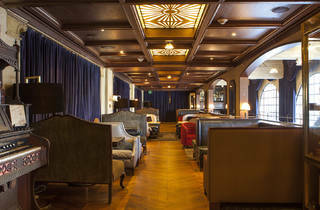 Be transported back in time at the Spare Room where Old Hollywood meets the cool and current bar scene with unique craft cocktails and the the view of the Walk of Fame below. Don't fear if you are not a seasoned bowler because the attendant will give you lots of tips and pointers. 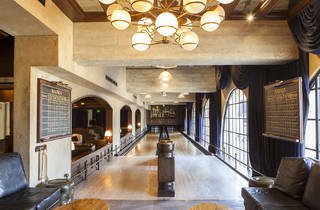 If you're going to splurge on a boozy bowling outing, do it here. 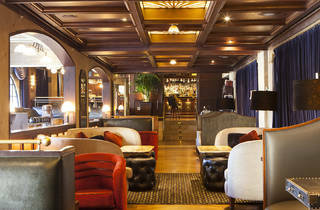 This place just exudes old school Hollywood cool, and the drinks are superb. They also happen to have especially snazzy bowling shoes. Spare Room transports you to a by-gone era of old Hollywood glam. Whether you come for a drink or to test your skills on one of their bowling lanes - this a great place to come and paint the town red! What a treat! If you're looking to impress someone—a date, a client, your mom—The Spare Room is a great spot to make people fall in love with LA. Not only are the cocktails fantastic, but the bowling experience is unlike any other in the city, in that you get your own personal scorekeeper and bowling coach for the duration of your game. Ask your coach to show you some trick shots, and remember to tip him well! How cool is this place? Next time you want to go bowling and get a few drinks, you MUST come here. It's such a different spot to bowl and the punch bowl is delicious—and dangerous! The Spare Room is super cool!! They have two beautiful bowling lanes, just make sure you make reservations ahead of time and they have delusions cocktails. We ordered a punch bowl with a gin base that was phenomenal! The Spare Room is a perfect marriage of delicious cocktails and exceptional design. The space is very cool and a great environment to hang out with friends. 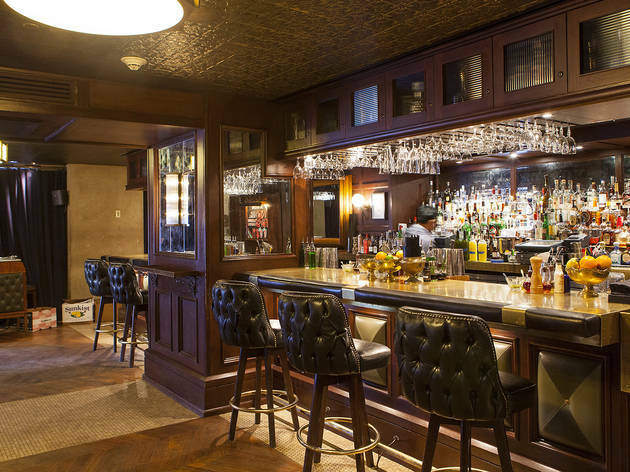 You'll definitely want to explore their fantastic cocktail menu. This place is amazing. Cocktails in a bowling alley, and good cocktails at that. I had the Salt & Vinegar Martini, averagely priced and delicious. The art deco theme sets a great ambiance too.